Thoughts on this black blazer? It was +20 Celcius on Saturday and I worked in my yard all day cleaning up the mess that winter leaves. And then it rained all day Sunday and over night, it turned to snow. Mother Nature has a cruel sense of humour! Today's outfit is Eileen Fisher from head to toe and features the waxed denim jeans in charcoal that I bought in the fall and have never worn. They were too tight to be comfortable but I was too lazy to pack them up and return them. So yesterday when tidying up the downstairs spare closet, I came upon them and wondered if now they would fit. Well yes indeed so voila - here they are. Love them! I then grabbed my charcoal tie-dye-esque silk tank and topped that with my bronze metallic open knit hi-lo cardigan. Doc Marten boots finish off the "dark and moody" theme and although not in the picture ('cause I snapped it quick in boss's office), I am carrying my black/with gold hardware leather handbag. I realize this is a rather colorless outfit but I love the mix of textures IRL - waxed denim, soft drapey silk, metallic open weave. I hope the visual interest takes away from any lifeless look the outfit could have. I'm currently watching two Eileen Fisher items from my favourite eBay seller. We're putting a new roof on our house and just paid our taxes yesterday so Spring/Summer shopping will likely either be through eBay or clearance racks to keep my spending in a comfortable zone. 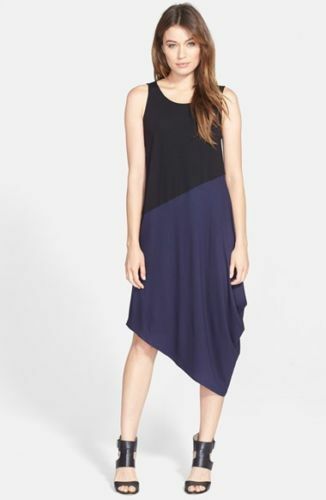 Pics #1 - #3: Blue and black color block jersey knit asymmetrical sleeveless dress. Made with the same fabric as my drape front EF dresses. Y'all know I love to wear dresses in the summer and combine them with my various toppers for my freezing A/C office. This is petite sizing so proportionate for my body. Although normally a dress straight from the hip is not flattering for my body type, I think the asymmetrical hemline which creates a "faux" taper would work in a similar manner to the tapered hemlines of my other EF dresses. Correct or wrong? I think the dress could be dressed up or down and be very versatile. What do you think of the particular shape and style for me? I had originally put a shirt dress on my Spring/Summer list but they are very difficult to find to work on my frame and shape so this would be instead. Pics #4-6: Lavender light wool/linen blend wrap sweater. I'm on the hunt for a light weight sweater for those cool summer evenings and also to take to our family vacation to the west coast in July. I'm wanting something that can be worn with a tee and jeans but also over a dress for an evening dinner on a patio. My complexion and hair work really well with shades of purple so the colour is a no brainer IMHO. The colour would work well with black, white and denim alike which is the majority of my wardrobe. I like the wrap style as it gives the sweater a bit of elegance as opposed to a cardigan. What do you think of the style and colour? ETA: I've added a third item below - a petite floral shirtdress from Hudson's Bay. It's nothing fancy but I've had it in my cart for about three weeks now. I love the shirt tail hem and the floral on black background. I can see the potential for wearing both with and without the self tie belt - without could give it that great sack look. You could also change the belt for different belts. This would work both at the office and for casual summer evenings out. Thoughts? I've been toying with the idea of adding a bit of 70's to my look but I currently don't have a lot in my wardrobe that is full on modern 70's style. But when reading through Angie's blog post again on ten ways to add 70's flair, I determined I had at least 3 things I could put together in an ensemble which would hint at the 70's. 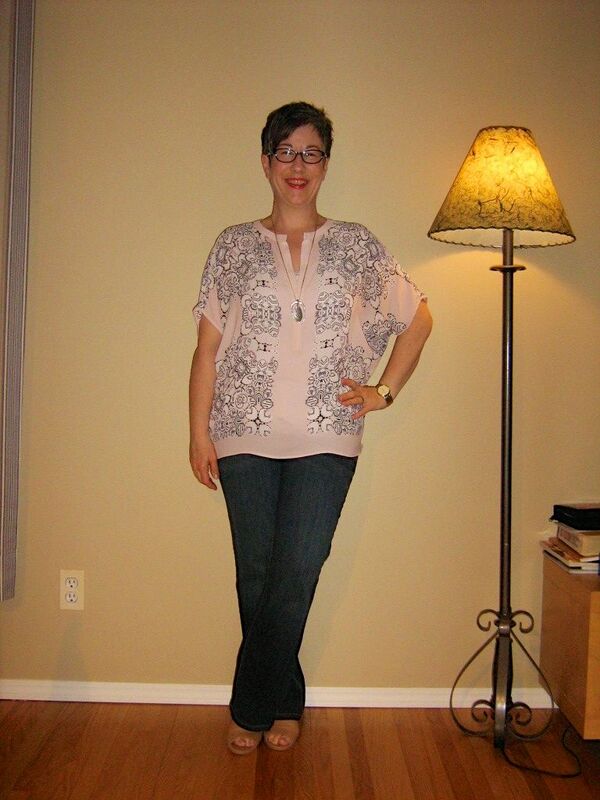 So my outfit started with my bootcut jeans (which fit again - YAY!). I don't do full on flares due to my short stature but I do love boot cuts - so these will be my version of flared jeans. I then added my blush drapey blouse as my version of a floral shirt and have added a long pendant as another nod to the 70's. The neckline of the blouse fights a little bit with the necklace but I still think it works. My camel peep toe sandal booties and large cream handbag finish off the outfit. And when I step outside, I'll pop on my blush leather jacket. So what do you think? Does this all work together? Is there a hint of the 70's in this ensemble? As always, all comments/suggestions welcome. Loved Angie's round up of soft white tops and one of my goals this Spring/Summer is to add more white to my wardrobe. For now, I will play with what I have in my closet. Today's outfit also incorporate Angie's formula for layering a coloured tank underneath a white top. So I started today's outfit with my white BF jeans. 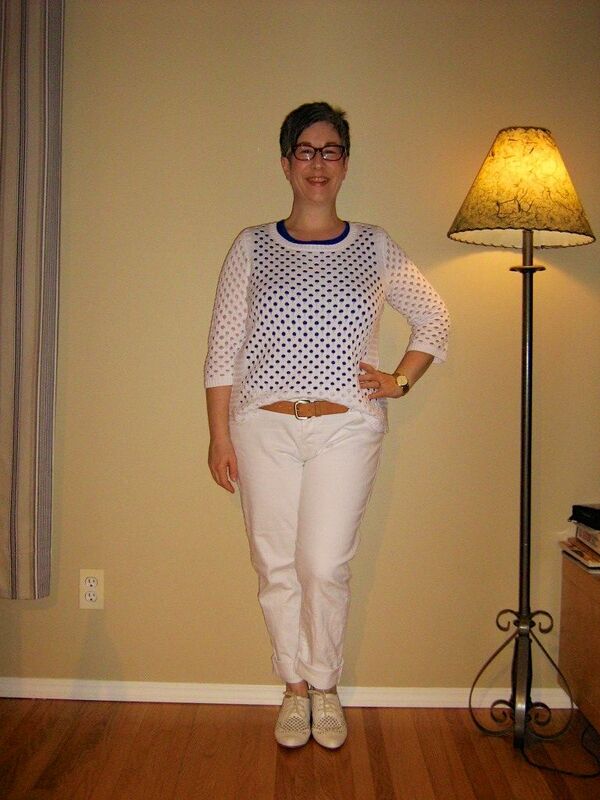 I then added a cobalt blue tank and layered over top of that my white hole-y pullover. Love how the cobalt peeks out of the laser cut holes. I semi tucked the pullover and added a tan leather belt. I really struggled with what belt to wear. I tried my wide white one and just wasn't feeling it. So I went with the tan - it feels more grounded. Hope it looks ok. I chose my laser cut bone oxfords for footwear - the laser cuts in the shoes mimic the laser cuts in the pullover. Plus it adds to my almost white-out look. Citron handbag, red specs, gold watch and wedding ring and swipe of coral lipstick finish off the outfit. Thoughts ladies? Does it all work together or does the tan belt and citron handbag make it look disjointed? As always, all comments/suggestions welcome. Today's outfit started with my favourite wardrobe item of all time - my black EF drape front dress. Remember this one? This is probably the most worn item I have ever owned and I will be wearing it a ton again this Spring/Summer. 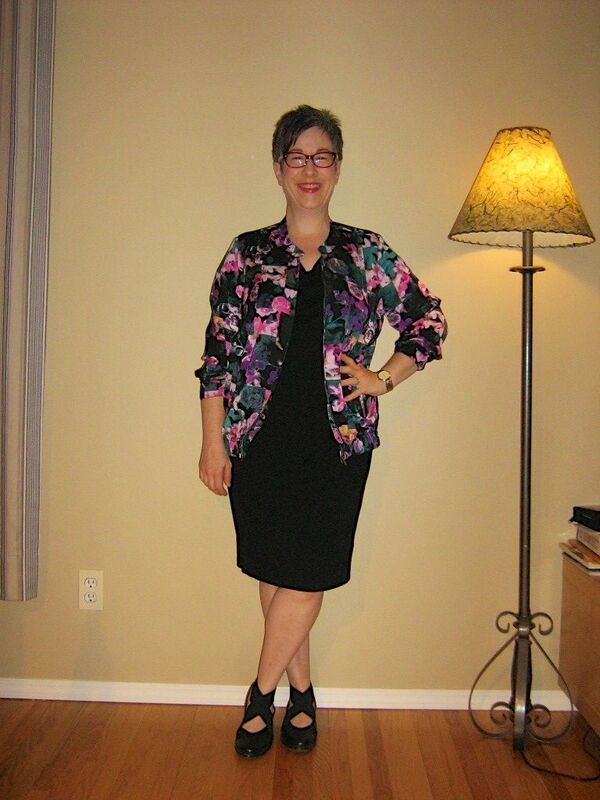 I topped the dress with my floral silky bomber jacket, scrunching the sleeves to add some structure. My PF is acting up a bit today due to a lengthy walk last evening so chose my Naot shoes for comfort (note to self: need to source extremely comfortable and supportive running shoe). I'm falling more in love with these shoes each time I wear them. I didn't have time this morning to change out my handbag so I hope the citron looks ok with this. So does this all work together? As always, all comments/suggestions welcome. Good morning beautiful Fabbers :) Spring has sprung in my neck of the woods and I'm feeling FABULOUS! With the skirt, I've paired a very simple white tee and then topped that with my bone leather jacket. Love that the white of the jacket and tee do not match. Footwear are my new camel coloured peep toe sandal booties (I have the feeling these are going to be worn a ton this Spring/Summer) and I grabbed my citron handbag for some fun colour - plus I love citron paired with animal print. Taupe/silver leather wrap watch, silver ring, red specs and swipe of coral lipstick finish off the outfit. Does this work? I'm wondering if the tee hits me in an unflattering spot and makes my hips look huge? As always, all comments/suggestions welcome. Dare I hope that Spring has really arrived in Winnipeg??? It was quite lovely over the weekend (although very windy at times) and the forecast is fab for the week. So out come the sandals! Today's outfit started with my black, slim leg EF trousers to which I added a white tank and my black/grey/white ombre silk sleeveless drapey EF blouse. LOVE this blouse! It is probably one of my favourite purchases EVER. 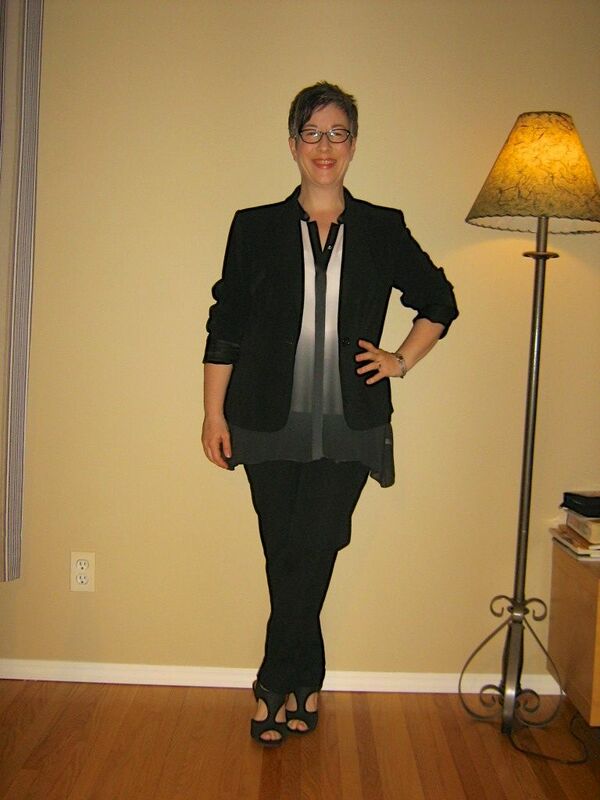 I then topped the outfit with my black blazer as I have a Board meeting today and need to be appropriately dressed. i grabbed my black low heeled sandals, silver watch and wedding band, black/white specs and a gigantic pop of colour with my bright coral handbag to finish off the outfit. Over the weekend I bought my Spring lipstick - I always buy a new shade for Spring/Summer. I went with a coral-with-hints-of-pink cream lipstick by Lise Watier. 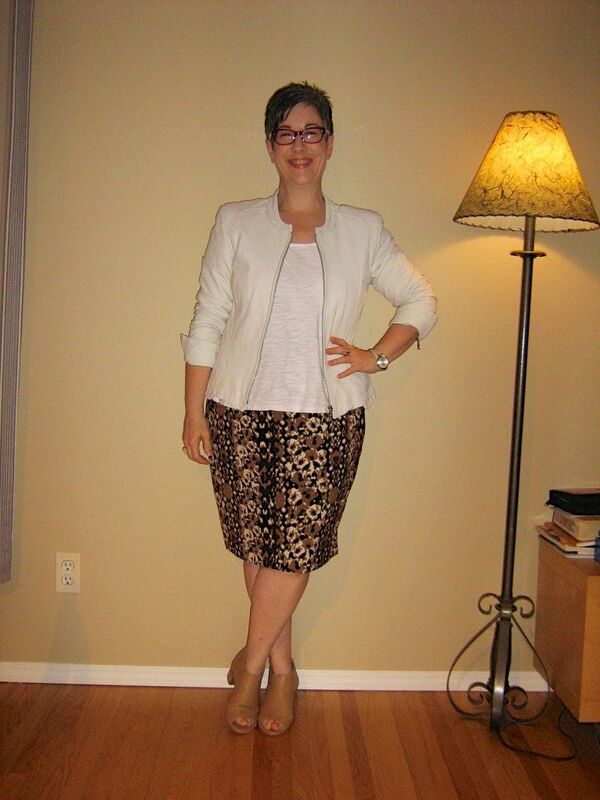 So…thoughts on this outfit ladies? Does it all work together? As always, all comments/suggestions welcome. I'm loving simple outfits these days - good fits, less layering, that sort of thing. And today's outfit is going to be one of my favourite silhouettes this spring/summer - fluid over slim. My outfit started with my slim leg dark wash jeans. I rolled the jeans to showcase the new camel coloured peep toe booties. 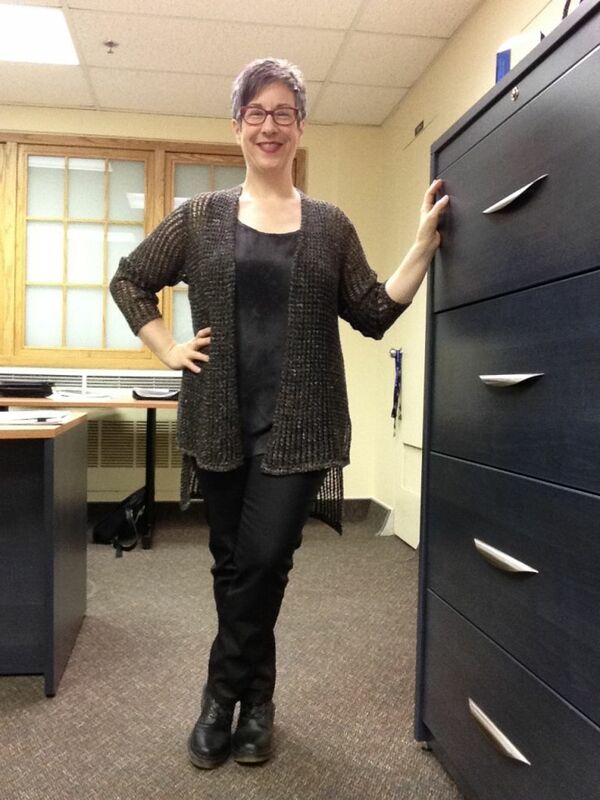 I chose my black asymmetrical drapey black blouse thingy (with black cami underneath for modesty). My citron handbag adds a pop of colour and some visual interest with texture. And then I finished off the outfit with my silver/taupe wrap watch, silver ring, red specs and red lips. So what do you think? Does it work? As always, all comments/suggestions welcome. A black blazer is an absolute ESSENTIAL in wardrobe - for all seasons. Denise (Cocolion) recommended this one from Express as she has it and indicated it works well for us short torso gals. It's not a true petite but would fit like one I suspect and the ruched sleeves is perfect for me - I scrunch my sleeves all the time anyway and with ruched sleeves, no concern about them being too long. Today's outfit is comprised of nothing new - in fact a few of these pieces are a couple of years old. And yet I'm drawn to them again and enjoying wearing them. Note to self: don't purge favourites too quickly. My outfit started with my burgundy skinnies which I've had for at least three years. I added a black leather belt and then added (with a semi tuck) my whimsical graphic fox tee. I seriously thought of purging this tee as I wasn't wearing it but it's the most expensive tee I've ever purchased and so guilt made me keep it. Now I'm so glad I did! 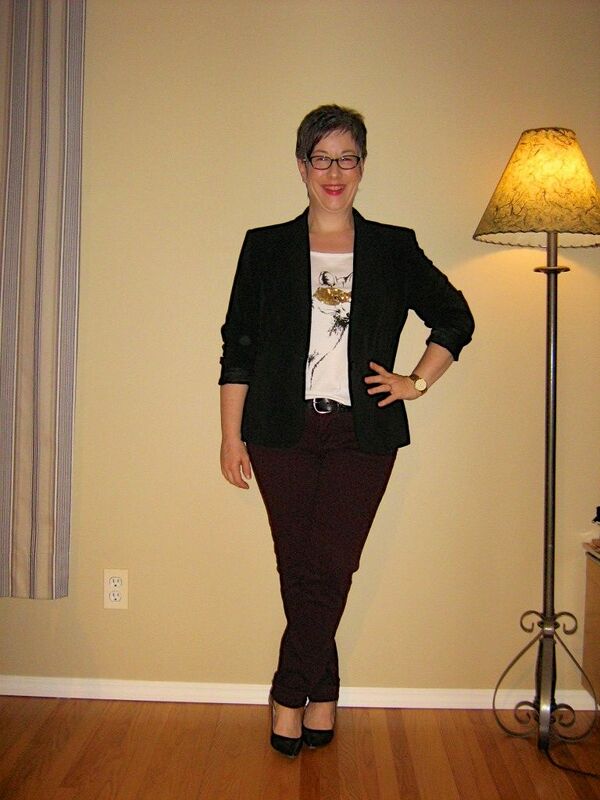 I topped the outfit with my black suit blazer which dresses up the tee and makes it appropriate for my office. 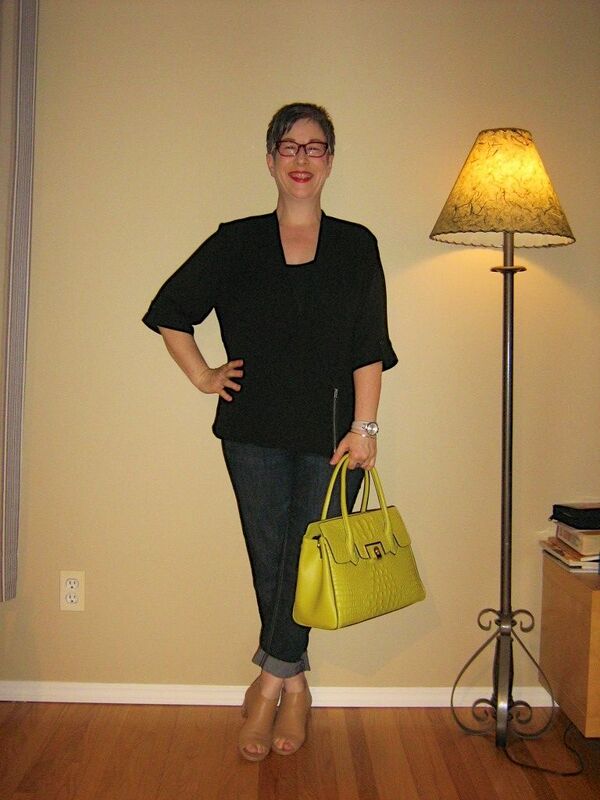 My black kitten heels, gold watch and wedding ring, black/white specs and citron clutch finish off the outfit. Thoughts on this outfit? Does it work? Does it still look current? As always, all comments/suggestions welcome.